The stories hidden behind the notes. Music is a powerful representation of the invisible realm. When I sit at my piano I feel an overwhelming task set before me; I am supposed to reiterate and interpret the stories that a composer, I never knew, wrote and created with his entire heart and soul. I like to look at the music before I play it and try to discover what the story is behind the notes. What was Chopin thinking as he wrote his 1st Nocturne? What vision was gained as Handel wrote his Messiah? What friendship drove Beethoven to write his last masterpiece? Behind each measure are conversations, tears, stories, un-slept nights, tussled hair, and frustrated madmen trying to cope with the voices in their head. The composers did not write music with a passive mentality, rather they wrote with their entire life hanging in the balance. Some went mad, some starved, some were poverty stricken, all for the purpose of what? Dictating the art and mind of musical composition. 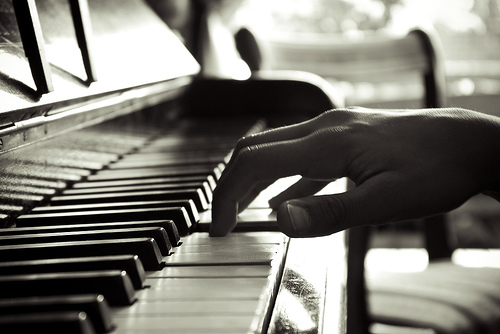 It can be overwhelming to sit at a piano and have an entire collection of masterpieces before you. Diving into the science and art of ordering sounds or tones is a task that one should not pursue lightly, but it should be entered upon with great gravity and readiness of heart.